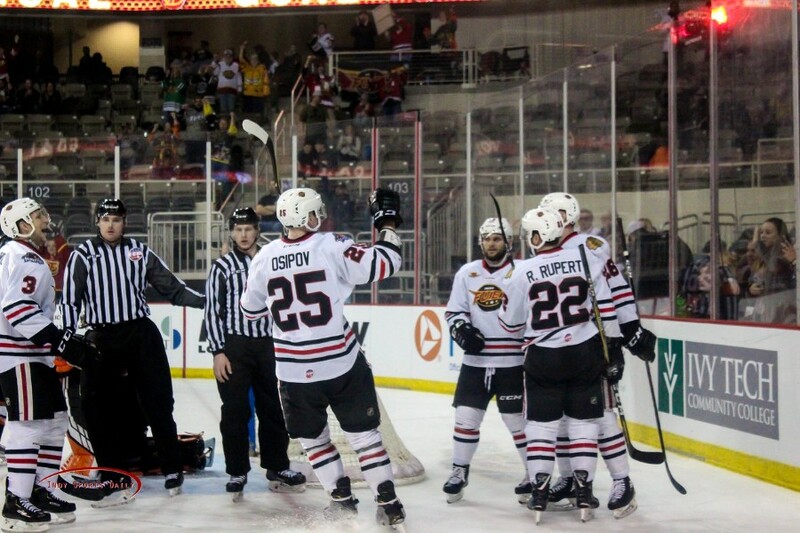 The Indy Fuel hit the ice to take on the Fort Wayne Komets on Friday night. So far this season, the Fuel have struggled against the Komets, going 2-4-1 against their in-state rivals. They were able to right the ship in this one, dominating the Komets in every aspect of the 5-0 victory. The first period opened up with both teams playing solid defense and taking away the passing and shooting lanes of their opponents. Neither team put a shot on goal for the first two-plus minutes and the Fuel didn’t register their first shot until four-and-a-half minutes in. Indy found their groove and put some major pressure on Fort Wayne netminder Lukas Hafner. The Fuel’s persistence paid off when Mathew Thompson opened the scoring with his 10th goal of the season. Just over two minutes later, Ryan Rupert beat Hafner on a tip-in from Logan Nelson to extend the lead to 2-0. That goal makes 12 on the season for Ryan Rupert. He and the Komets’ Kevin Gibson mixed it up after the first-period horn and each got two minutes for roughing to open the second period. The second period opened quieter than the first. Indy’s Guillaume Naud collected his first of three penalties in the period. The Fuel’s penalty kill kept the Komets of the board. Naud went to the box once again, and Indy stood tall again. Seconds after the Fuel killed off Naud’s penalty, Brett Welychka put the puck past Hafner for his ninth goal of the season and gave Indy a 3-0 lead. The Komets frustration boiled over as Shawn Szydlowski threw a punch at the Fuel’s Connor Moynihan. Moynihan went to the box for unsportsmanlike conduct and Szydlowski took a seat for hooking. After Naud’s third penalty of the period, the middle frame looked to be heading for a quiet finish. However, Moynihan got redemption for his earlier penalty and put the Fuel up 4-0 with a tap in goal, his sixth of the season. The third period saw the Komets looking for answers. They made the goalie switch and put in Eric Levine for Hafner who had allowed four goals on 18 shots. Fort Wayne played at a frantic pace all period long, but Matt Tomkins stood on his head and kept the Komets off the scoreboard all game long and earned his first career shutout. Josh Shalla put the cherry on top of the 5-0 victory with his team-leading 17th goal of the season with less than two minutes left. This game was easily the most complete effort of Indy’s season thus far. The penalty kill stood tall and Tomkins made 30 saves. The victory moves them into a tie with the Komets for third place in the central division. The Fuel are back in action tonight, January 26, with a game against the Kalamazoo Wings. Indy is 4-1-0 against the Wings this season. The puck drops at 7:35 pm ET at the Indiana Farmers Coliseum.